The PUMA Pen Knife is a surprisingly tough little jacknife. For small jobs around the house, the office, or the campfire, the PUMA Pen Knife is designed for those light jobs that don't require a heavy blade. However, you should not underestimate this pint-sized PUMA Pocket knife. Handmade in Solingen, Germany, it's built to the highest specifications, and will stand up to a lot of work. The PUMA Pen Knife has two blades; a 2-3/4" spear point blade and a 2" spey blade. Both blades are crafted from D1.4 Cutlery Stainless Steel, which keeps its edge even during frequent use. With the longer blade extended, this German Knife measures a mere 6", which makes it an excellent knife for light jobs such as opening boxes, cutting paper, or even just sitting in front of a campfire and whittling, thanks to the fine control that it offers. The handle comes with bone or staghorn scales that are as attractive as they are durable. 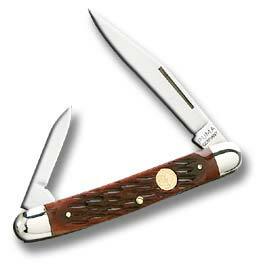 The handle measures a mere 3-1/4" long, making it an excellent choice for a boy who is getting his first pocket knife. However, it is also ideally suited to a man's pockets when he wants to keep a knife with him for any small job that might arise. This trusty knife is designed to be durable and handy, and provides a lot of quality in a very small package thanks to premium German craftsmanship. Overall, it is a very good knife for a variety of uses and it will be a welcome friend either in the home or out in the woods, and you can be sure that your PUMA Pen Knife will be ready no matter where or when you need it. Return from PUMA Pen Knife to the German-Knife.com home page.